If you ask a child what noises cattle make he will say “Moo.” Cattle can make several different sounds including mooing, bellowing, snorting and grunting, and they use these noises for different things. People who spend a lot of time with cattle can tell what sort of mood the herd is in by the noises they are making. 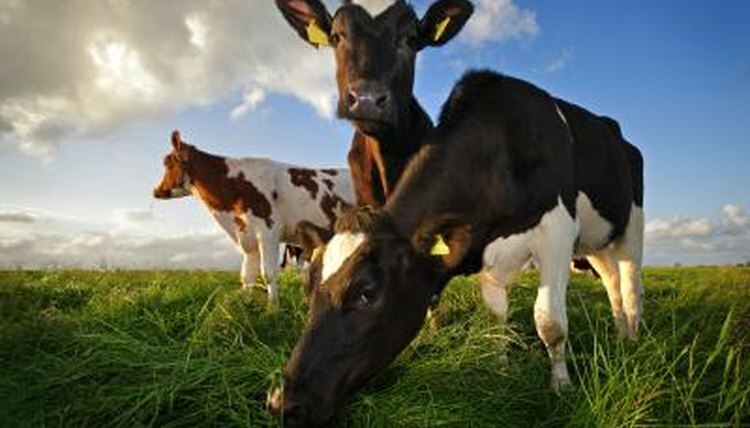 Cows and calves make noises to communicate with each other and locate each other. A few days before a cow gives birth she will regularly make little grunting noises that are heard by her unborn calf. She will continue to regularly vocalize like this after the birth for a few days, while she keeps the calf alone with her and away from the herd and they form a strong bond. When they return to the herd she has a special bellow she will make to call the calf back to her side. Each calf recognizes the sound of its own mother. Cattle will make noises when they recognize something is about to happen. The first of the cattle to see a feed truck arriving or the milking shed getting ready for operation will vocalize with a loud moo to bring it to the attention of the others. High-ranking cattle will then add their noises as they start to move toward the feeding area, milking shed or other area where they know something is about to occur. Cows show agitation by snorting, shaking their heads and swishing their tails. If a mother cow snorts at you, move away from her baby and her territory or she could charge. Bulls in neighboring yards will snort at each other and paw the ground. Back slowly away from snorting cattle as they could challenge you. Bulls will also bellow at each other in an aggressive way. Cattle will make noises if they are hungry or stressed. Calves separated from their mothers will bellow when they want to be fed, and the sound of calling calves stimulates milk production in cows. Cattle that are yarded for the first time sometimes make bellowing noises, as they are fearful of a new situation. If a cow dies during calving, or from old age, the other members of the herd will bellow in distress at finding their herd mate. Cows whose calves have been taken from them will also bellow, sometimes for days.